It’s that haunted time of year, when skeletons come out to play. But Edindale, Illinois, attorney Keli Milanni discovers it isn’t just restless spirits who walk the night . . .
After her recent promotion to junior partner, Keli is putting in overtime to juggle her professional career and private Wiccan spiritual practice. With Halloween fast approaching, her duties include appearing as a witch at a “haunted” barn and hand-holding a client who’s convinced her new house is really haunted. But it’s the disappearance of Josephine O’Malley that has Keli spooked. The missing person is Keli’s aunt, an environmental activist and free spirit who always seemed to embody peace, love, and independence. When Josephine is found dead in the woods, Keli wonders if her aunt’s activities were as friendly as they seemed. As Keli comes to terms with her loss—while adjusting to having a live-in boyfriend and new demands at work—she must wield her one-of-a-kind magic to banish negative energy if she’s going to catch a killer this Samhain season. Because Keli isn’t ready to give up the ghost . . . This is the fourth book in the series, and as the previous books, it is a home run! The characters are engaging,the whodunit was well written, and the premise is A1. I hope this series continues! I voluntarily reviewed an advance reader copy of this book. 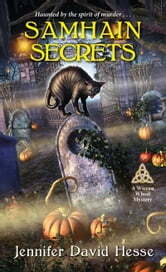 One of my favorite genres, probably 2nd after urban fantasy, is paranormal cozies. This one fit the bill quite well. I’ve read a couple of the previous books in the series, but that is not a problem as the author does quite well keeping the reader informed of anything that is important to know if the other books in the series haven’t been read. One of the aspects I love about this book is where it takes place: Southern Illinois. I live quite close there, and it’s a pleasure to feel that the setting is close to me, almost like Edindale is just one town over. And, of course, the writing was great, the characters fun, and an interesting plot. If you like a paranormal cozy, do give this book and series a try! Highly recommend! I was provided the e-book which I voluntarily reviewed.